1 of 4 In a small bowl, combine butter, chives, pepper, garlic powder and red-pepper flakes until evenly blended. Transfer to plastic wrap and shape into a 3-inch-long log. Wrap to seal; refrigerate 30 minutes or until firm. 2 of 4 Prepare outdoor grill with medium-hot coals, or heat gas grill to medium-high. In a shallow dish, season meat with Worcestershire sauce, then sprinkle both sides with garlic powder, salt and pepper. Let stand at room temperature for 10 minutes. 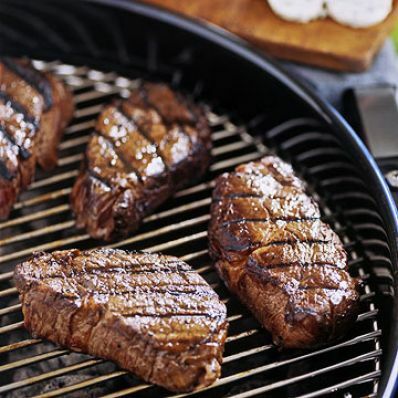 3 of 4 Grill filets for 4 minutes per side, or until internal temperature registers 135 degrees F in the thickest part of the meat for medium. 4 of 4 Once meat is cooked, remove filets from grill. Let rest 5 minutes. Meanwhile, remove chive butter from the fridge and cut into thin slices. Top each filet with 1 to 2 butter slices and serve warm. Per Serving: 2 mg chol., 24 g Fat, total, 12 g sat. fat, 222 g fiber, 137 mg sodium, 36 g pro., 377 kcal cal., 0 g carb.